A large Buddha statue being illegally constructed in the land of a Tamil Hindu temple in Mullaitivu was hurriedly declared open by Sinhala Buddhist monks on Wednesday, with the aid of Sri Lankan police and the archaeology department. While a Right to Information (RTI) request to Karaithuraipattu (Maritimepattu) divisional council confirmed that the monks had no permission or land rights to build the statue, the Mullaitivu magistrates court was due to hear about the illegal constructions on Thursday (Jan 24), leading locals to accuse the monks of rushing through the statue opening before a potential injunction served by the court. As well as police officers, army personnel and archaeology department officials, among other visitors from the south, a professor from Peradeniya University, Kapila Gunawardene, also attended the opening. Buddhist monks who had seized the lands of Muslims and established a vihara in Arisimalai, in Pulmoddai - Trincomalee were also present. 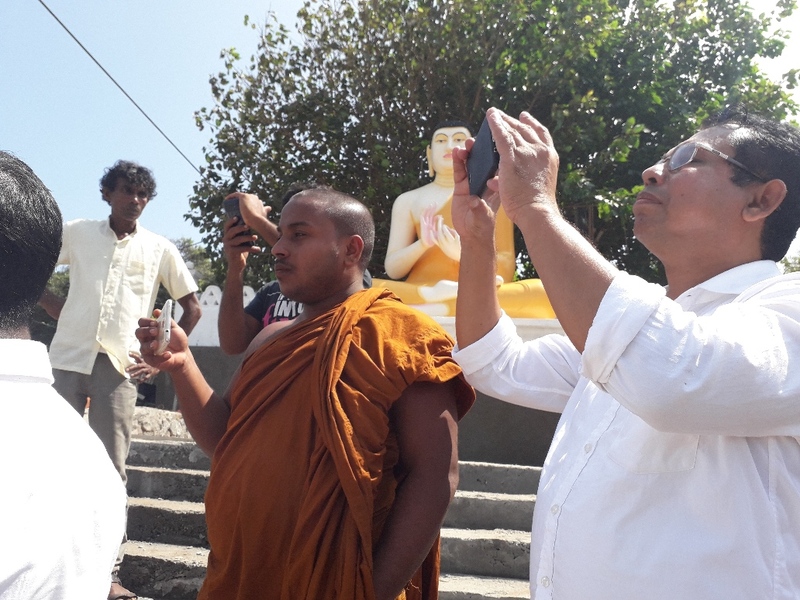 Tamil journalists covering the opening were harassed by the attendees, including the monks, and were harangued about how information about the Buddha statue had been circulated to local media. Tamil journalists have regularly been harassed and intimidated while covering the construction of the statue, by construction workers and other officials. Former Northern Provincial Council member T Ravikaran was also harassed during the event. A dispute over the statue in Neeraviyadi in the Semmalai area of Karaithuraipattu division (Maritimepattu) had been ongoing for over five years. Residents and local authorities had prevented attempts to construct a vihara and other Buddhist infrastructure for a long period, however Buddhist monks were accused of pushing through the construction of a large Buddha statue towards the end of 2018, when local authorities were distracted by Sri Lanka’s political crisis and the heavy floods in the North. While local Tamils claim the Neeraviyadi Pillaiyaar Kovil had been at the site for generations, a gazette notification declaring its lands as archaeological premises had reportedly been issued in or around 2013, when a Sinhala Buddhist monk named Colombe Medalange had taken up residence near the premises with the help of the occupying Sri Lankan army. The resumption of works to the Buddha statue had been a cause of heightened tensions in the area, with a recent confrontation breaking out last week when Buddhist monks stormed and disrupted Thai Pongal rituals at the Hindu temple. Following this incident Mullaitivu police filed charges against both the Hindu temple administration and the Buddhist monks for disturbing the peace. While the case went before the Mullaitivu magistrates court on Tuesday, Tamil representatives presented evidence of the illegality of the monks’ project, which is due to be taken up by the court on Thursday. Responding to a Right to Information (RTI) request, the divisional council confirmed that the construction of the Buddha statue and the monk’s residence in the land was indeed illegal. - There was no evidence of Buddhists ever having lived permanently in the area. - No lands had been allocated for the construction of a vihara in the stated premises. - The divisional council had not granted permission for the current construction work being carried out by the monk. - No applications had been submitted to the council for the construction of a vihara on state land. - The divisional council had not provided any land permit documents to the Buddhist monk for his residence on the specified state land. - The council did not grant any permission for the gravel excavation that had taken place next to the specified land between 2012 and 2013. The divisional council also said it was currently engaging in efforts to gather comprehensive information about the rightful landowners of the disputed lands. Vocal opposition to the ongoing Sinhalisation - by way of of Sinhala settlements and Buddhist constructions - of Mullaitivu, and the North-East overall, has been growing among locals. Tamil groups say the problem remains unaccounted for as the state uses several different fronts including the archaeology department, Mahaweli authority and forest department to carry out land seizures and occupations.